Finger Lakes 3-D Degreaser ™ is formulated to quickly and effectively remove grease, tar, oil, and dirt from parts and equipment. This water-emulsified formula is non-flammable, contains nonchlorinated solvents or petroleum products, has a pH of 10.5 – 11.5, is biodegradable, non-caustic, non-corrosive, phosphate free, alcohol free and contains no regulated VOCs. 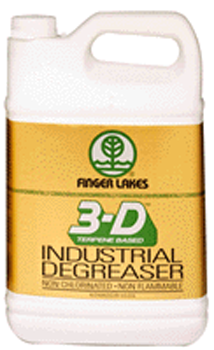 3-D Degreaser™ provides an environmentally conscious approach to degreasing parts and equipment. Alpha Terpineol, which is EPA approved under SNAP (Significant New Alternative Program), is the base ingredient used in the water-activated formula. 1. Spray liberally onto all parts to be cleaned. 2. Allow to sit for 5 to 10 minutes. Brush if necessary. 3. Rinse thoroughly with clear water. 4. Use only in well-ventilated areas.